The threat with damage occurred on 1,1 km section of the Włodzica river inside the town of Nowa Ruda, between the place where the river flows along the Cmentarna street (N50o35’1017’’, E016o30’10.18’’) down to the bridge at the street connection of Stara Droga and Górnicza (N50o35’32.36’’, E 16o30’39.51’’). EEA for the project has been carried out taking into account the assumptions from the 2006 report. Positive opinions were received from the angling association and an ornithologist who designated trees not to be removed before end of the breeding season. Dendrologic inventory that was carried out was a base for the legally binding decision on felling of trees number 20/MK/2008 of 14th April, 2008. Decision on environmental conditionings for the permit of the investment was issued by the Mayor of Nowa Ruda 6th of January, 2009. According to oral information of the Nowa Ruda Deputy Mayor, the decision was issued basing on the document produced by the Provincial Government of the dolnośląskie Voivodship i.e. “Nature Inventory of the dolnośląskie Voivodship for the Nowa Ruda Town” dated 2005 containing the statement that “in the river and streams’ valley alluvial forests has been destroyed” and on the dendrologic expertise prepared by an external contractor for the purpose of tree felling permit. Additionally, a screening procedure was carried out for the project basing on which the competent authorities i.e. Starosta (County Governor) of the Kłodzko Powiat (County) and State Sanitary Inspector for the county issued their decisions that the EEA is not obligatory. In the opinion of NGOs the report on nature should have been prepared and there should be consulting of a naturalist as to the change of the project scope and compensatory measures. The planned work was among others to remove all trees and other vegetation and to strehnghthen both banks with stones stabilized with a net. It was planned to broaden the river bottom to 10m. The planned starting date of the works was first half of September. 	0,95 ha of the priority habitat 91E0 - Alluvial forests with Alnus glutinosa and Fraxinus excelsior. On the threatened it occurs as a marrow stripe along Włodzica river, mainly occur as the subtype 91E0-5 i.e. submontane alluvial ash forest. On most of the occupied area the alluvial forests are well or very well developed. There is also a small patch of alluvial forest in its early stage qualifying as habitat 91E0. The planned works assume removal of practically all trees and strengthening of the banks will cause recovery of alluvial forest impossible. 	About 130 m long strip of the habitat 8220-3 Siliceous rocky slopes with chasmophytic vegetation. This habitat occurs in three spots along the threatened section of the river (30 m + 50 m +50 m). They occur on the rocks washed by the waters of Włodzica or directly neighbouring the river bed. On most of the length where they occur they are well or very well developed. Planned work would cause total destruction of all plots of this habitat. 	About 5 ares of the habitat 6430 - Hydrophilous tall herb fringe communities of plains and of the montane to alpine levels. They occur on one plot along the river section in question. The earth works and embankment would cause total destruction of this habitat. 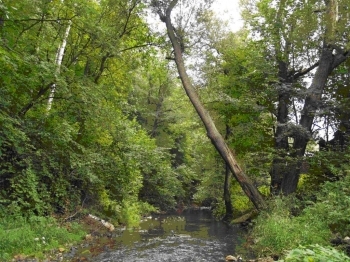 The threatened section of the river is also a place of occurrence of the Habitat Directive Annex II species – otter (Lutra lutra), and breeding site of the Bird Directive Annex I species: Black woodpecker (Dryocopus martius), Grey-headed woodpecker (Picus canus), Kingfisher (Alcedo atthis), and other rare birds protected in Poland such as Dipper (Cinclus cinclus), Grey wagtail (Motacilla cinerea), Lesser spotted woodpecker (Dendrocopos minor), Green woodpecker (Picus viridis), and in addition a site of Grass frog (Rana temporaria). In July 2009 the Lower Silesian Foundation for Eco-development, in accordance with the Parliament Bill of 13 April 2007 on prevention of environmental damage and harm repair, send an informing notice to the Regional Director for Environment in Wrocław about the threat of environmental damage and petitioned for urgent intervention preventing start of the planned work. Simultaneously the WWF Poland appealed to the Director of the Regional Water Management Authority for suspension of the works until clarification of the issue and for the possibility to discuss changes in the regulation project of the above mentioned section of the Włodzica river. Independently, the Workshop for All Beings association issued a motion to the Self-governmental Appeal Board in Wałbrzych asking for instituting ex officio the nullity proceedings for the issued decision on environmental conditionings. 15th of September, 2009 a field visit to the site of planned works in Nowa Ruda took place in order to verify the notification about the threat of environmental damage. The field study team consisted of representative of the Regional Water Management Authority, staff members of the Regional Directorate for Environment in Wrocław, representative of the Lower Silesian Foundation for Eco-Development, Mayor and staff of the Nowa Ruda Town Office, representative of the Skanska SA – the contractor for the works. During the visit the occurrence of natural habitats in the river bed and on the slopes of the Włodzica Stream was confirmed. Taking into account that the investment in question belongs to the key flood prevention projects in the Regional Operational Programme for the dolnośląskie Voivodship for 2007-2013, Director of the ROP department organised a meeting in the Marshall Office to work out a common understanding of the environmental threat. The provisions of the meeting were that: the Regional Director for Environment will commission to an independent expert environmental research indicating methods to minimise negative impact of the investment and the investor agreed to hold the works on the conflict section of the river. On 18th of November, 2009, Regional Director for Environment in Wrocław issued a resolution obliging the subject using the environment, i,e, Regional Water Management Authority in Wrocław for implementing preventive measures due to the direct environmental threat for the protected habitats and species effecting from the planned investment on Włodzica river. The preventive measures listed in the resolution should be made manly during the works and some after the regulation of the river bed. The effectiveness of the preventive measures should be monitored in the 4-year period by checking the habitat status in Summer months.